This month we’re celebrating the yearly nation-wide campaign from the Soil Association, Organic September. The initiative aims to promote organic farming and products and provide the public with engaging information about organic practices. That’s why we’re treating you to a delicious organic coffee, grown with care and passion in harmony with nature. Organic coffee is grown without the use of artificial pesticides and fertilisers. This not only reduces the farmers’ exposure, it also means healthier soils and more habitats for birds and wildlife, as well as a top quality product for the coffee drinker. Cafédirect, work with smallholder farmers who own the land they grow the coffee on and look after it. The farm is usually passed in the family, so it’s important to them that it stays fertile and rich to insure harvest and steady income for the next generation. The farmers always seek to diversify in order to build a sustainable ecosystem and many coffee producers are adopting closed loop farming, where everything they need for soil fertility can be found on the farm. For example, the foliage from the banana trees that are grown for shade or animal manure can be used as organic compost or fertilizer for the coffee trees. Most smallholders already employ organic practices to grow their coffee and a lot of farms have more than one certification to reflect all of these efforts. 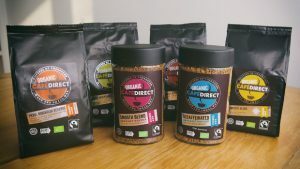 Cafédirect have now launched a new range of premium Organic coffees. From smooth instant to rich ground coffee and beans roasted to perfection, there’s a product to suit all tastes! The beans are grown without the use of artificial pesticides and fertilisers, so the coffee is good for you and the environment. To explore our organic coffee from Cafédirect or visit the Cafédirect site to read more about their organic coffee.